how can I raise my small boat Bimini top about 6" ~ I am 6'5". When I stand up in my boat I have to crouch, being very tall. I need pole extenders to raise the Bimini to 6'9". I saw extenders on some on-line site, but cannot find them. It should be simple: cut both sides of 1" dia. center pole, insert 9" extension with sleeves or smaller dia. like a fishing rod ferrule. Can you advise? Have product that will do trick? There are a couple of ways to do it. Take a look at the pictures of these bimini top parts. One is a extension unit and the other is a tube joint. I think the photos are pretty self explanitory. 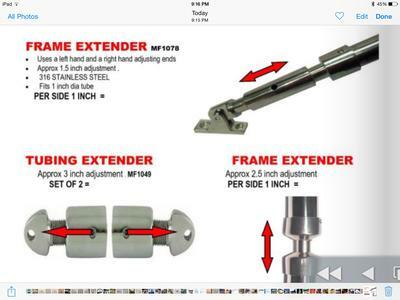 I am not sure of either the inches the frame extender gives you, nor the price. I will have to check on both. I am pretty sure a pair willl be fairly pricey. The tube joint style will require you to have two of them on each side. It's been awhile since I priced them as well. I can check and happy to get them for you. I could have them dropshipped straight to you. The tube joint does come in plastic by another company, but since the foot of your frame is taking so much pressure and wind, I would be inclined to use stainless steel in this occasion. Does either one of these appeal to you? Join in and write your own page! It's easy to do. How? Simply click here to return to Bimini Top Parts Question and Answer Discussion.